This product, for customers who use their Vetro clock on a network, eliminates the need to have a power outlet near the clock. Instead, power is carried through the Ethernet cable that connects the clock to your network. The kit has been tested to perform with network cable as long as 75 feet. The kit consists of the two adaptors shown at right. The adaptor on the left is used at the clock; the one on the right is used at your server or PC. 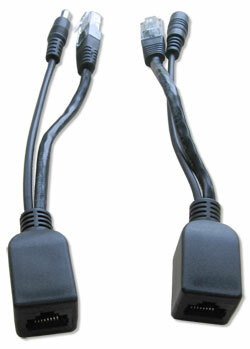 You'll plug the two leads at the top of the adaptor into the network jack and the power jack on your Vetro clock. The network cable that connects the clock to your LAN is plugged into the network jack at the bottom of the adaptor. The network lead at the top of the adaptor is plugged into your router or switch. The lead from the Vetro power supply is plugged into the power jack at the top of the adaptor. Your network cable plugs into the network jack at the bottom of the adaptor. Besides convenience, a possible additional benefit to using the Power Over Ethernet Kit is that most servers are used with an Uninterruptible Power Supply (UPS), and the Vetro power supply can be plugged into the UPS. This will keep the clock from losing the correct time during a power outage as long as the UPS is functioning. Payment Options: We accept Visa, MasterCard, American Express and Discover Card, as well as PayPal and Amazon Pay. To order our products COD, we require a certified check and a $12 fee. Please contact	us for details. TimePilot Corporation warranty*: For one year after you purchase a Power Over Ethernet Kit for Vetro, we will repair or replace (at our discretion) any malfunctioning hardware. The purchaser pays only the shipping to return the malfunctioning part to us. Return policy*: If you are dissatisfied for any reason during the first 30 days after you purchase a TimePilot hardware product (TimePilot Extreme Blue, Vetro and Tap+, iButtons, iButton Receptor, etc.) from TimePilot Corporation, we will refund the purchase price if you return the product to us, freight prepaid and insured for the value of the product. If you choose this option, we hope that you will take a few minutes to help us understand why. Please be sure to call us for an RMA (Return Merchandise Authorization) number before returning the product. Please note: TimePilot software-only products such as the TimePilot Professional Edition or Enterprise Edition Upgrade and TimePilot PC can be exchanged if the disk is defective, but we cannot offer refunds on software. We can be reached at (630) 879-6400. *Note: The money-back guarantee and warranty are void if the system is returned in a damaged state for any reason, including damage that occurs because of failure to follow installation instructions. If you choose to use your own cable to connect the timeclock to your PC, you could damage your system and will void all guarantees and warranties, express and implied.